This series of stories takes place in the IDW G1 continuity during the events of Robots In Disguise. The Iacon Communication Service is Iacon's definitive news service run by the provisional government for the people of Cybertron. It is run with a policy of complete honesty, to avoid escalation of tensions between factions. The former Autobots Circuit and Longtooth serve as reporters in this most illustrious of news services. Together, they chronicle the events going on at ground level. With assistance from the Autobot security patrol and the Decepticon and N.A.I.L. population, they investigate misgivings in their city and broadcast every minute of it. Last edited by Mellow Gadget on Thu Sep 18, 2014 9:07 am, edited 1 time in total. Story 1: The Hammered N.A.I.L. “…and then I said “No, officer, that’s not a monster. It’s a Nebulan in a fur coat!”” The diminutive Transformer known as Loafer addressed the constantly-moving crowd of Cybertronian civilians. He didn’t see any heads turn when he delivered the punchline. None at all. That was his funniest joke, too. He couldn’t help but feel disappointed. They’d laughed at the jokes on Master. Was he losing his touch, or was the populace of Cybertron just a tough crowd? The orange and purple Cybertronian sighed and moved off the supply crate he had been previously standing on. He turned his back on the crate and, with considerable effort, pushed against it, forcing it back towards the entrance to a run-down old structure. At ground level, Loafer was barely as tall as the crate, as were his two, for lack of a better word, bunk-mates. He and his two friends had hitched a ride on a beaten-up old star liner back to Cybertron. Once they arrived, however, they struggled to find any place to stay due to the return of all the civilians that had fled the planet when the war broke out. An abandoned dome structure, which Loafer swore he recognised as a repurposed colony ship, was where they had made their home. “How’d it go today?” A droll, monotonous voice spoke as Loafer shoved the crate back into place, where it stood among other crates. Loafer looked over to see a blue and yellow mech, not much taller than he was, sitting on the ground, an empty can of energon at his feet. “Did you check in the other rooms?” Loafer asked hesitantly. The third member of their group liked to spend time wandering the dome, and neither he nor Rodney knew what he got up to in that time. Loafer watched Rodney disappear into another room, then reached down and picked up the energon container. He swirled it around and heard the tell-tale sloshing of energon. Rodney seemed to have left some in there. He lifted it to his lips, thinking that it would be poor form to waste it in such a way, when he heard Rodney’s voice call his name. There was something about the way he said it that made Loafer nervous. He dropped the canister and moved into the other room, where he found Rodney staring at the adjacent wall. “So, did you fi…” Loafer trailed off as he followed Rodney’s line of sight. He saw a red and beige Cybertronian, around their height, pinned against the wall, optics dulled and energon leaking from a wound on his torso. The Cybertronian had been pierced by a long dull grey beam of metal, and the body had slumped down over it, revealing that it came out the other side of him, and was what held him to the wall. “…Kirk.” Was the only word Loafer could muster himself to say. With a terse uttering of “Keep everyone out of here until I say so”, Prowl disappeared into the dome, leaving a pair of burly-looking guards outside, bright red Autobot symbols emblazoned on their arms. They had their red optics on a pair of bots loitering outside. One was a large khaki fellow and held a heavy and cumbersome-looking piece of machinery in his hands. The other was an obnoxious shade of yellow with detailing and accents in a veritable cornucopia of colours, and was speaking at the machine the other bot held in a quick and inquisitive tone of voice. Both appeared to not have any faction emblems on display. “You’re a tough guy. You can handle it.” Circuit replied somewhat encouragingly, somewhat irritably as Axis adjusted his grip on the camera. “Now, where was I…ah, yes. Did they have something to do with the death, or is a third party to blame? We’ll bring you more as we discover it. This is Circuit reporting for the Iacon City News, your unofficial dose of the truth behind Iacon. Back to you, Andromeda.” As he finished speaking, he gave the camera a brief wink. Circuit, however, looked at the guarded entrance intently, as if seeking some minute detail in the door. “Relax.” Circuit replied, oblivious to the cause of his camerabot’s discomfort. “Slamdance doesn’t have to know a thing.” He could see that his argument wasn’t going to persuade Axis, who still looked resistant to the idea. “Okay, how about we take a quick look inside? Just get a recording of the body and get out again. No-one gets hurt.” Circuit suggested in a hushed tone, so the guards couldn’t hear. That didn’t seem to work, however, and Axis still looked apprehensive. “Leave Prowl to me.” Circuit replied dismissively as he calmly moved away from the entrance and around the edge of the dome. Left with little choice, Axis followed the yellow bot, lugging the camera along with him. “Wait, Circuit! Why are we going down here?” the camerabot questioned as he struggled to keep up with Circuit. “The main entrance is guarded,” the yellow mech replied “but I’m willing to bet that there’s a secondary entrance somewhere down here.” Circuit eyed the walls intently, scouring them for any sign of a concealed entrance or hatch. Presently, as the two made their way to the opposite end of the dome, and Axis had almost exhausted himself, Circuit came across another entrance. This entrance seemed to have been designed with concealment in mind as, aside from the blatantly visible locking mechanism, it seemed to blend in almost seamlessly with the exterior of the dome. Curiously, this entrance had been left unguarded, in what Circuit assumed was simple oversight. That didn’t seem like Prowl, to not notice something like this. “Oh, look at that. It’s locked.” Axis said quickly. “Never mind. Let’s go.” He put a lot of emphasis on the word “go”, almost as if he was trying to tell Circuit something. Circuit, however, didn’t get the message, instead noticing that the entrance wasn’t actually locked or sealed. All it took was a bit of force and the door swung open, giving way to an eerily dark interior. Again, this didn’t feel like a choice Prowl would make, working in a dark environment. Circuit assumed that the structure’s power cells had been depleted. “You might want to put a light on.” He said to Axis as he recklessly plunged into the darkness. Mere moments after he entered the dome, Circuit collided with something hard and metallic, and he staggered back. Dazed, he put a hand out in front of him, and it met something cold and hard. “I think there’s a wall here.” Circuit reported. “Be careful when you come in.” He heard Axis give a tut of disapproval, but chose to ignore it. He valiantly pressed on, Axis and his camera not far behind. The way ahead was shrouded in shadow, and Circuit unfortunately couldn’t see in the dark. He jumped as a bright light flicked on behind him. He wheeled around, and saw Axis had activated a powerful light on the camera. It illuminated the room, making their surroundings seem even more eerie. The bots crept through the building, the light from the camera illuminating the way ahead. The rooms were almost completely empty, which unnerved Circuit. Every step he took seemed to echo back to him, forcing him to tread lightly. Once they had ventured further into the dome, they heard movement and speech. Circuit crept quietly up to a wall and leaned against it, listening intently. Axis gently lowered the camera to the ground as he repeated Circuit’s movements. Up ahead, a pair of voices were speaking calmly, and the two had to keep quiet. Circuit only recognised one of the voices. The crisp, business-like tone the bot spoke with indicated the presence of Prowl. Circuit was at a loss as to the identity of the other until they spoke. It was a similar sharp tone, but a fair bit higher and with a very distinctive melodic accent. Circuit stifled a groan. He recognised that voice from the first word. Falcia. It was just his luck that Falcia was here. If he was caught, he’d hear no end of angry remarks from her about responsibility and knowing his limits. 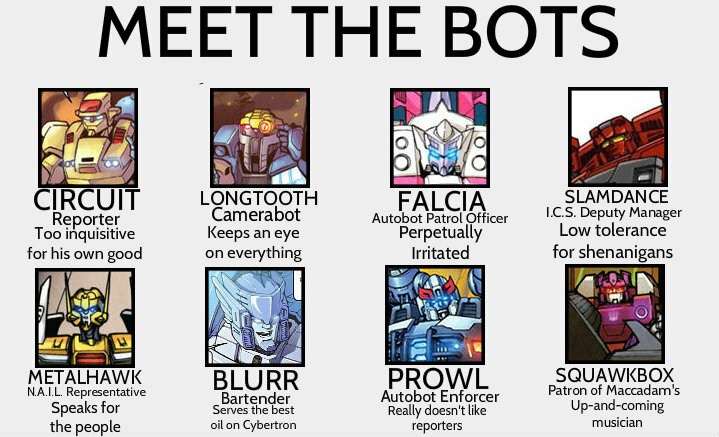 Yet, his fear of what Falcia would do was greatly overshadowed by Prowl’s possible reaction. Falcia scared him, yes, but Prowl downright terrified him. “I’ll join you.” Prowl’s voice replied. This was followed by the sound of fading footsteps echoing throughout the building, then the opening and closing of a door. Circuit was confident that they had gone outside. Quickly taking a peek into the other room, he saw it was completely abandoned. “Come on, Axis.” He muttered, sneaking into the room. Axis looked as if he was going to die of fright as he lugged the camera off the ground. “Not if he doesn’t catch us.” Circuit replied as he stepped carefully around various bits of debris that littered the ground. Unlike the other rooms, this one was positively cluttered. Construction materials littered the floor, as did a series of black wires. This room was quite well-lit, compared to the rest of the dome. A series of portable lights were aimed at a section of a wall, illuminating the red and beige miniature corpse pinned to it. On the ground directly underneath the body, amidst puddles of pink energon, stood two miniature phials of . A flash of grief went through Circuit’s head, but it was quickly replaced by the urge to get a recording of the sight. Circuit dashed out of the room and back towards the exit. He was panicking like he’d never panicked before. If either Prowl or Falcia caught him, his career would be, and he didn’t think he’d get any more chances to make things right. In his panic, he had completely forgotten that Axis was the one with the light. That fact came flooding back to him…right before he hit a wall and fell backwards. Dazed, he looked straight upwards, and saw the bright red optics of the guards glaring down at him. Falcia’s words cut Circuit deeply. It wasn’t the first time he’d been in this situation, and he could tell her patience was wearing thin. The look she gave him when she’d returned to discover him and Axis was the accumulation of all the anger and annoyance she felt towards him. Circuit felt thoroughly ashamed, but he stood his ground nonetheless. “It’s worth the risk to bring the truth to light! I thought you could understand that!” Circuit pressed, raising his voice slightly above hers. Circuit didn’t have a response for that. He tried to summon one up, though, but nothing came to mind. “You owe us a lot more than that, Circuit.” The patrol officer said, handing Circuit a datapad. “Your camerabot wanted me to give you this.” Circuit took the pad and looked at the display. It showed a message from Axis. A very simple message-only two words long-but one Circuit didn’t want to see. If there was one person who intimidated Circuit more than Falcia and Prowl, it was his boss, Slamdance. He knew that the ex-Autobot’s attitude towards rulebreakers was an extremely negative one, almost on the level with Prowl. He also knew that Slamdance had sworn never to lie, so whatever he said was going to be true. The Cassette Combiner took one look at the datapad and slammed it on his makeshift desk angrily. “Plenty.” Slamdance replied. “They just don’t want to work with you. You’re doing this to yourself.” He put his hands together and placed them on his desk. Circuit watched as the Combiner closed his optics, as if he was thinking. Then he opened them, and Circuit hoped that he was going to give him another. “Get going, Circuit.” Slamdance fixed the yellow bot with one of his most threatening glares. “Alright, alright, I’m going!” Circuit quickly obeyed, heading out of his boss’ office and back out into the bustling city. Assuming his new alt mode of a small yet speedy four-wheeled vehicle, he moved through the crowd, up towards the dock. Up ahead, as Slamdance had told him, was a curved and thoroughly battered transport ship. The crowd seemed to thicken as he got closer, but Circuit could still make out Cybertronians of many different shapes, sizes and colours disembarking, some with supply containers in their hands, others carrying nothing. No way, Circuit thought to himself. Metalhawk? Voice of the N.A.I.L. population Metalhawk? Metalhawk here? He thought about asking for an interview, then cursed himself for forgetting what his highest priority was. He could hear Metalhawk greeting the new arrivals one by one, saying things like“Welcome back…It’s good to have you here…I assure you, all of your questions will be answered…” Just off to the side stood an unused holoprojector. Normally, they were used to display advertisements and important messages, but it seemed like its services weren’t needed by anyone today. Anyone except for Circuit, that is. Unnoticed by the general public, Circuit pulled himself up onto the docking bay and crouched by the holoprojector. Unnoticed by the crowd, he ran his hands across the machine, looking for a way to switch it on. He’d used holoprojectors before, but was unfamiliar with the design of this one. There was no visible switch or way to input a message. After a micro-cycle of searching by hand, he found the activation switch purely accidentally, and only noticed the projector was on when he saw heads turning. The projector was displaying, in vibrant blue lettering, “For a good time, call Fastlane.” Circuit scrambled for the switch again, deactivating the projector. “It’s Tap-Out, and you’re welcome.” The green bot stepped off the dock and reintegrated into the crowd. Circuit quickly got to work tapping out the message he wanted. In a few short moments, the words “Camerabot Wanted” flashed above Circuit’s head. With any luck, the interested bots would come rolling up to him. Cycles passed, and Circuit started to grow bored. His wish for a camerabot still flashed above him, but no-one seemed to be taking notice of it. He had a feeling that he was making a fool of himself again. The docks had all but cleared, leaving only a few bots behind to bring the remaining supplies out of the ship. Metalhawk and the welcoming group had left a long time ago. He sat alone, longing to leave and go to Maccadam’s. At the same time, however, he really really wanted to stride victoriously back into Slamdance’s office with a new camerabot and say “Ha! And you didn’t think I could do it!” So he remained at the dock, with his head in his hands, cursing his own stubbornness. “Camerabot, huh?” A smooth baritone voice asked. Circuit looked at the bot that the voice came from. A bot about his size coated in purple and silver stood before him, a visor of blue optics looking at the advertisement. Circuit looked him up and down, spying Decepticon insignia garishly stamped on his ankles. Circuit watched as one of the bots, a hulking black and blue mech, looked over to them and placed the crate he was carrying down on the ground. As the mech walked over, Circuit was immediately drawn to his optics. One of them was significantly bigger than the other. He wondered whether this bot had some kind of in-built camera. “Good to meet you.” Longtooth replied in a voice higher than Circuit had expected. “Circuit, I need you!” Slamdance’s voice in his ear made Circuit jump and shout in surprise. Longtooth and the smaller bot looked at him curiously. “Are you okay there?” Longtooth asked, tilting his head slightly. “Right away.” Circuit sighed, lowering his hand. He turned to face Longtooth, a dangerously inspired glint in his eye. “Well, Longtooth, I’ve got a job for you. Come with me!” Without even waiting for the bot, he jumped down from the dock and changed into his alt mode. “Hey, I didn’t say yes!” Longtooth called after him, keeping his voice in a level tone, but the reporter had already disappeared into the crowd. Circuit stopped short of the crime scene when he saw a group of Autobots gathered around a building. He approached it tentatively, staying out of sight behind a wall. He tried to focus on what the Autobots were saying, but he kept getting distracted by a low rumbling from behind him which seemed to be growing louder with every passing moment. He turned around, and spotted a bulky black vehicle with a tow line poking out of the back positively ploughing through the crowd, until it halted in front of him and began to shift its form until Longtooth stood in front of him, looking more than a little irritated. “You know, we could have finished talking before you ran…” Longtooth began, but soon found himself shushed by Circuit. “On the contrary, Circuit.” Longtooth raised a hand to his larger left eye and seemed to twist it. Circuit watched him, confused initially. Then the pieces fell into place for him. Because if I try, I’ll get arrested, he thought to himself. “Only this solar cycle.” Circuit explained in a hushed tone. “The first body was found stuck to a wall by a metal shaft about seven cycles ago.” As they watched, the Autobot group parted, granting the pair a clear view of the murder victim. It was an orange and purple bot, around the same size as the last victim if Circuit had to guess, and they had been impaled with a metal shaft, in the same manner as the previous victim. Vibrant puddles of energon had formed where the shaft touched the ground. After a few micro-cycles, Circuit turned to Longtooth. “I think we’ve got all we need. Let’s get out of here.” He quickly and silently headed towards a more crowded area of the city, Longtooth following behind. “Hold up, Circuit!” Longtooth replied, still in that neutral tone. Circuit stopped and turned to look at the camerabot. The positive atmosphere of Maccadam’s Oil House permeated every inch of the establishment. The patrons of the bar seemed to actually be smiling, a rare sight on Cybertron nowadays. As Circuit approached the oil house, he noticed that the words “Under New Management” were still emblazoned on the windows. Serving-bots moved through the bar, delivering drinks to waiting customers. Circuit took a seat at the bar, gesturing to a seat beside him for Longtooth. A light blue bot moved around the bar and came to a halt in front of the pair. “A Visco for me, Blurr,” Circuit replied, resting his forearms on the bar “and some energon for the new arrival.” He added, nodding his head at Longtooth. “It’s not exactly what I expected Iacon to be like.” Longtooth replied, after a brief pause. “I wanted to set down further away, but our ship was attacked.” Circuit and Blurr briefly exchanged glances as the reporter was handed an oblong glass full of a deep black liquid. “Thanks, Blurr.” Circuit nodded gratefully. Picking up the glass, he carefully tipped it against his mouth. As Longtooth watched, the oil inside seemed to slowly drain away. This surprised him, as he noticed Circuit didn’t exactly have a mouth with which to drink the oil. “How are you drinking that?” Longtooth hesitantly asked. “But you only just got here!” Blurr exclaimed. As Circuit and Longtooth walked beside each other, their contrasts became far more distinct. Longtooth positively dwarfed Circuit, as did a number of other bots in the crowd. “Where are we going, Circuit?” Longtooth asked as they headed towards a seedier part of the city. “No, no, not at all.” Circuit shook his head. “It’s only happened a few times since I got back. Ah, here we are.” He found himself once again facing the dome where he’d observed the aftermath of the first murder and been arrested. It looked like the Autobots had left the structure be, as the imposing guards had vacated the entrance. Circuit cautiously approached the entrance, looking back at Longtooth who, he was pleased to notice, was still at his back. “Keep an eye out for any Autobots.” The reporter said as he stepped inside the dome, taking a look around the antechamber. It seemed to be devoid of activity. He took another step, heard Longtooth call “Watch out!” and felt a blunt impact on his upper torso. He felt his legs give way and he fell to the ground. “Who’s there?” an obviously agitated voice asked harshly. “Is it you? You’re not taking me without a fight!” A smaller blue and yellow bot came into view, looking angry at first, then shocked when he spotted the downed Circuit. He dropped the small pistol he had been carrying and rushed to the reporter’s side. The blue bot looked hesitant to speak, as if it was some kind of big secret. He looked down at the ground and muttered something inaudible to the reporter. “The fact that you’re holding a photon pistol in the place where the first murder happened.” Circuit replied. The bot tried to respond, but it seemed that he had been backed into a corner. “You have a name?” Circuit continued. Circuit felt a stab of sadness for Rodney. There was no doubt what he was going through should never happen to any bot. His morals told him to try and comfort Rodney, but the instinct he had honed as a journalist told him to keep asking questions. Rodney looked up at Circuit, and the reporter saw all the despair Rodney no doubt felt in one expression. “Who’s coming after you?” Circuit pressed. Circuit nodded and help Rodney to his feet. “You won’t regret this.” He said, lifting the small blue bot up and placing him on his shoulder. “We’ll talk to Falcia. She’s good at what she does. She can help.” The reporter, the camerabot and the small bot left the dome and began to walk the streets that led to the wreckage of Kimia Facility or, as it had come to be, Autobot High Command. “It was on the part of the Autobot security patrol that the non-affiliated indigenous life-form known as Airachnid was arrested for murder and scamming today. The city of Iacon can rest easy, knowing at least one hostile element is now locked away. This is Circuit reporting for the Iacon City News, your unofficial dose of the truth behind Iacon. Back to you in the studio, Andromeda.” The image of Circuit standing in front of the dome cut out as Slamdance, Longtooth and Circuit himself reviewed the footage Longtooth had taken mere cycles ago. “I gotta say, you two, you did good on this story.” Slamdance admitted, folding his arms. “Yeah, well, I can’t take all the credit for it.” Circuit admitted. “That’s still something.” Slamdance interjected. The swooshing sound of Slamdance’s office door opening caught everyone’s attention. Metalhawk stood in the doorway, a datapad in his hand. “Am I interrupting anything?” the neutral bot asked. Circuit and Longtooth could only look on as the two bots exchanged words. At first, they were worried about what this was going to do for their careers, but they relaxed when Metalhawk said that they’d be allowed to keep their jobs. Then Metalhawk turned to look at them. “I watched your report on the murders.” The spikey yellow and blue jet-former said. “I’m no expert on journalism, but I think you’ll go far.” Metalhawk turned back to face Slamdance. “I’ll come back tomorrow with more specific outlines, but for now, I think your reporters may want to celebrate.” As Metalhawk left, Slamdance grinned in a way Circuit had never seen him grin before. Circuit and Longtooth heeded the order and headed for the door. Longtooth, however, felt a hand on his shoulder. He looked back and noticed it was Slamdance’s hand. “I need to have a word with you in private, camerabot.” The combiner said, giving Circuit a look that said “don’t you dare listen to this”. Circuit walked outside and the door closed. Longtooth turned to face Slamdance properly. “What do you make of Circuit?” Slamdance asked. Longtooth thought for a moment. Circuit was a good enough bot, but he acted on instinct too much. “I think he needs to take a step back sometimes.” He replied. “That won’t be too hard for me.” Longtooth said, letting out a small laugh. Slamdance laughed as well, appreciating the jest. Silently, Longtooth left the office and met Circuit outside. The pair transformed and headed for Maccadam’s, where they ordered drinks. Eventually they were joined by Slamdance, Andromeda and several other bots Circuit knew worked for the news service. They all drank their fill of oil and energon and indulged themselves in the entertainment available. For a moment, Cybertron wasn't the ravaged world they knew it to be. Instead, it was the mighty, shining world they knew from a long time ago.